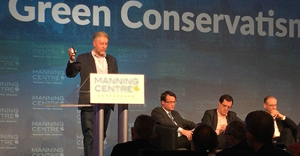 Fraser Institute senior fellow Ross McKitrick urged an audience of conservatives at the Manning Centre Conference to reject the "irrational but popular" idea that "the environment is bad and getting worse." There were two notable moments in the ongoing fight against climate change this weekend. And the second notable moment? McKitrick – an economist who once signed an evangelical declaration claiming “global warming is one of many natural cycles of warming and cooling in geologic history” and is part of “God’s intelligent design and infinite power” – urged conservatives to defeat “the raft of false beliefs” surrounding climate change science. Yet if the idea is so fringe, why does the United States government’s interagency National Climate Assessment say “extreme weather events are increasing” and attribute this “primarily to human activities”? “Extreme weather events are a key concern for Canada and there is growing confidence that some types of extreme events will increase in frequency and/or intensity as the climate continues to warm. Well, on this point, McKitrick is actually 100% right. McKitrick was one of four panelists discussing “Green Conservatism,” alongside former Harper advisor Mark Cameron, economics professor Christopher Ragan, Enbridge executive Roxanna Benoit and Postmedia’s Andrew Coyne. However, Four out of five (80%) of the panelists seemed to be in consensus that conservatives should be taking climate change a little more seriously than McKitrick. McIver had an interesting response to a panelist from the Fraser Institute, who suggested unions are holding governments "for ransom." 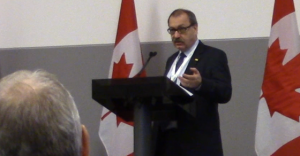 What is the interim leader of Alberta’s Progressive Conservative Party up to this weekend?